Pavilion tents are apt to be used for various party and events occasions including parties, wedding ceremonies, anniversaries and other various celebrations. We use high grade fabric and advanced machines in manufacturing these tents. It provides necessary safety to the events from the adverse weather conditions. A magnificent treat for the lovers of creativity! This Stylish Pavilion Tent is designed with a white color dome, vibrant color edges along with maroon and orange color side scalloping and drapes. 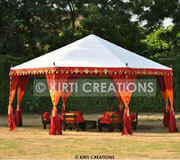 Elegant looks and attractive pattern makes Stylish Pavilion Tents perfect for decoration of evening parties.